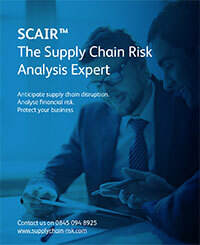 Did you miss the Supply Chain Risk newsletter? If you missed our latest newsletter you can follow this link to see a roundup of key Supply Chain issues and developments aimed at helping supply chain managers and professionals to minimise exposure and manage their company’s vulnerabilities. In today’s global supply chains, the threats that are most likely to elude identification are those buried deep in an organisation’s upstream supply chains. The loss of a direct, single source of a key material could prove a major headache for one company, but what happens if the common source of an industry feedstock should fail? Systematic supply chain analysis and quantification of the value at risk can help to identify critical exposures and justify practical mitigating actions, such as establishing alternative sources in geographically distinct areas, or holding more strategic stock. The following article considers a number of events which have had global consequences and lays down a challenge to industry to work together to find mutual mitigations… Click here for the complete Supply Chain Risk White Paper.